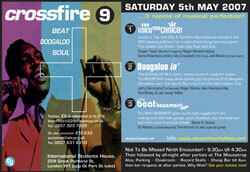 Crossfire returns on Saturday 5th May at the International Students House in London. 3 rooms of vintage club sounds – Voice Your Choice (rare/northern soul), Boogaloo In’ (R&B, boogaloo, dancefloor jazz, club soul and ska) and the beat Basement (beat, garage, psych, freakbeat and blue-eyed soul). For full details, check the events section.